All factors considered, solar energy systems in Canada operate at an approximate efficiency of 15%. This means that 15% of all solar energy hitting the solar panel is eventually turned into usable electricity. *This assumes a solar panel efficiency of 20% and an overall system efficiency of 75% in accordance to the math used by National Resources Canada. 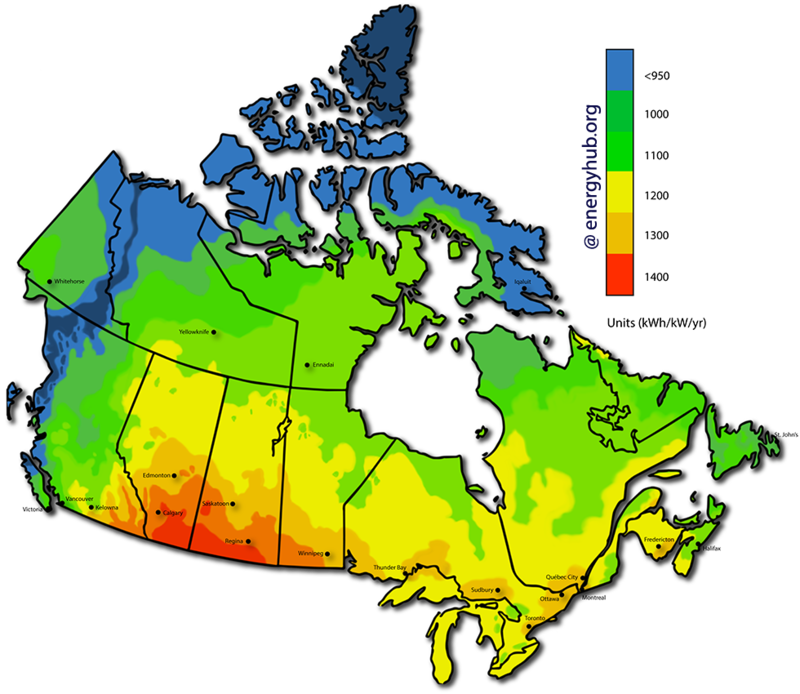 The above map shows how much usable energy can be produced in Canada given sunlight and current system efficiency levels. 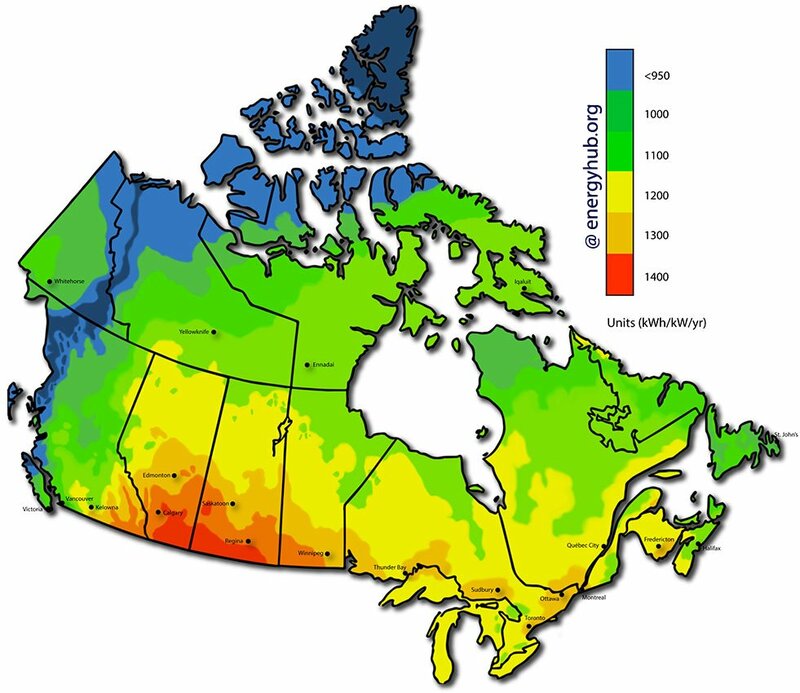 Maps for every province and territory can be found on the Solar Energy Maps Page. While the overall efficiency of a solar system is approximately 15%, there are several individual factor that contribute to this number. Many of which can be altered to make your system even more efficient. Solar panel efficiency is the efficiency factor that often gets the most attention – and for this reason research and improvements in panel efficiency have skyrocket over the past several years. We will briefly cover the main factors that affect panel efficiency, but you can also read about these factors in-depth in this SunPower Module Degradation PDF. Best Research-Cell Efficiencies (10.6% – 46.0%), data by NREL. When it comes to questions about efficiency, the first question that people usually ask is: “How efficient are solar panels?”. This question is unique because it’s the only efficiency factor that can’t be controlled (except for buying or inventing a better performing panel). The efficiency rating of solar panels is usually given as a percentage (%) of the total electromagnetic radiation (energy from light) that will be converted by the panel into DC power. For modern solar panels, this number usually ranges between 16% – 22%. However, the efficiency rating is sometimes given (and promoted) for both the solar panel and the solar cell – but these are two separate things. Solar cell efficiency. Some manufacturers (and installation companies) will try and make their panels sound better than they are by reporting the efficiency of the ‘solar cell’ contained within the panel. However, this is not a true measure of the panel’s output efficiency because it doesn’t take into account the other components within the panel. The cell efficiency is meant for scientific research, analysis, and comparison – not to represent the end-product. Solar panel efficiency. The real number that you’re looking for is the solar panel efficiency. This number takes into account the efficiency of all cells within the panel, the spacing between them, and the internal resistance of the panel itself. The solar panel efficiency rating (also called the ‘module efficiency’) is the true % of light that’s converted into DC power. Solar Panel Degradation, SunPower vs. Conventional Panel. All solar panels will lose some of their capacity to produce power over time as the silicon-based molecules within the cells naturally degrade. Typically, power output will decrease between 0.75% and 0.25% per year. Manufacturers often state this degradation over a 25 year time-frame as indicated in their warranty. For example, after 25 years, SunPower solar panels are guaranteed to produce 92% of the power that they produced on day one. This would be equivalent to 0.32% yearly degradation [(100% – 92%) / 25 years]. Since output is almost always guaranteed over 25 years, be sure to question your installer about this if they offer you anything less. SunPower is regarded as having the most efficient solar panels on market with a 21.5% peak efficiency. As it turns out, they also have one of the best production warranties – after 25 years, their panels are guaranteed to produce 92% of the energy that they produced on day one! LG has the next best panel with a 21.1% energy conversion efficiency. This panel also has a 25-year output warranty, but it’s only guaranteed to produce 87% of the energy that it produced on day one. Panasonic is third in line with their most efficient panel converting at 19.1% and a 25-year production output guarantee of 91%. *Only commercially available products in Canada were considered. STC – Standard Test Conditions (laboratory conditions). NOCT – Normal Operating Cell Temperature (realistic conditions). Inverter Efficiency Graph Illustrating CEC Test Protocol. Used from scandia.gov. No inverter converts 100% of DC electricity produced by the panels into AC electricity due to internal resistance causing energy to be released as heat. The percent of electricity that’s actually converted to usable electricity is referred to as the ‘inverter conversion efficiency’. The conversion efficiency, as you can see in the graph above, changes depending on how much power your panels are producing (relative to the size of the inverter) and the operating voltage of the system. When reading about inverters you will often come across two terms: ‘peak efficiency’ and ‘CEC efficiency’. The peak efficiency is the highest conversion efficiency capable of the inverter, given optimal power output and optimal system voltage. The CEC (California Energy Commission) efficiency is calculated by taking a weighted average of three different operating voltages and six different power outputs (indicated by the points in the graph above) to better reflect real world operating conditions. The CEC efficiency rating has become the industry standard for comparing inverter efficiencies. Currently, the most efficient string inverters are made by SolarEdge with a CEC efficiency of 99% and the most efficient microinverters are made by Enphase with a CEC efficiency of 97.5%. Take Away: String inverters are more efficient than microinverters at converting electricity from DC to AC (but they are not necessarily the most efficient on an overall basis, read the next section for more info). Power Optimizers may be more efficient than microinverters or string inverters alone because voltage can be ‘conditioned’ for maximal conversion efficiency. The efficiency in which an inverter can convert DC to AC doesn’t tell the whole story because different inverter types perform differently under certain circumstances. For this reason, microinverters and power optimizers are always more efficient than string inverters if you expect your system to be shaded (think trees, neighbours, your roof, dust, leaves, snow, etc. ), or if your panels face more than one direction*. Thus, string inverters are only appropriate for use when differences in individual panel power production is not expected (ground mount system with no shading). The technical reason for why this happens is because string inverters are designed to only produce as much power as the least productive panel in the ‘string’. So when one panel fails, they all do (they behave much like your old Christmas lights). This also makes it difficult to locate a problematic panel. Take Away: Even though string inverters are more efficient at converting electricity from DC to AC, microinverters and power optimizers are more efficient on a overall basis for most systems. *There is an exception to this rule that is sometimes permissible: a multiple MPPT string inverter must be used and each string must be connected to groups of panels with similar performance expectations (for example, one group may be all east-facing panels and at x angle, another group may be all south-facing panels and y angle). This exception only applies to panels facing in different directions, string inverters are still less efficient if any type of shading is expected. Another inverter efficiency graph, this time clearly indicating peak efficiency and showing efficiency below 10% rated output power of the inverter. Used from Penn State University. The last way that inverters can cause your system to be less efficient is due to their relative size. Sizing your inverter (or inverters) to your solar panels is extremely important because power will be lost if your inverter is smaller or larger than what is needed. But this is not an easy task (and installers have different opinions about how it should be done) because standard sizes for solar panels don’t match standard sizes for inverters. As you can see in the graphs above, the conversion efficiency of an inverter begins to drop rapidly when the power being produced by your panels is roughly 10% of the rated power output of your inverter. For example, if you have an inverter that’s rated for 1000 Watts but your panels are only producing 100 Watts, then your inverter will be converting electricity at an extremely inefficient rate and it may be fair to say that your inverter is too large for your system. Larger inverters also use a greater amount of ‘baseline’ energy needed to keep them running. Thus, having an inverter that’s sized too large for the amount of power that you expect your panels to produce will cause your system to be less efficient than it needs to be. Since your inverter will only produce as much power as it’s rated for, having an inverter that’s sized too small is also not good. For example, if you have 1500 Watts of solar panels on your roof but you’re only using a 1000 Watt inverter, than you will only get 1000 Watts of power regardless of how much power your panels are producing. In another example using microinverters, let’s say the maximum power rating of your solar panels is 320 Watts but the maximum rating of your microinverters is only 280 Watts. This means that even if your panels are producing 320 Watts of power, your inverters will only put out 280 Watts. That’s a 12.5% loss in peak power just for the inverters being smaller than the panel’s output, this loss is called ‘clipping’. So you might be thinking it’s better to have an oversized inverter than an undersized one. Well, this isn’t always the case. Since solar panels don’t often perform at their peak rated output, it’s sometimes better to have an undersized inverter (even though power will be ‘clipped’ on sunny summer days) so that the inverter is more efficient under lower light conditions when panels are not producing power at their peak output rating (as is often the case). Take Away: Sizing your inverter is a complicated issue and can only really be done effectively by a system design engineer who has access to historical weather data and sophisticated modeling software. Neither an over or undersized inverter is good, but often times the optimal size for an inverter is slightly less than the total power output rating of the solar panels (especially here in Canada). In terms of efficiency, there are many things to consider when setting up your system and all of them can be easily covered by comparing the differences between ground and roof mount systems. 1) Ground mount systems can easily be setup facing the optimal direction. The optimal direction for systems in Canada is south, or an azimuth of 180° (The direction, if given in degrees, is called the ‘azimuth’). 2) Ground mount systems can easily be setup tilted to the optimal angle. The optimal angle is different for every location but it can be roughly calculated by taking the degrees latitude of the system location and then subtracting 10. For example, if you’re setting up a system in Charlottetown, PEI then your latitude is 46° (just Google it). After subtracting 10 you will get your optimal tilt angle of 36°. In reality this is 2° away from the truth in Charlottetown, but as stated, this is a broad formula that will work for most of Canada. You can use the PVWatts Calculator (another site) if you’re interested in determining a more precise number. 3) Ground mount systems maintain a more optimal operating temperature. Ground mount systems stay cooler than roof mounted ones because there is often lots of free flowing air going over the equipment. Solar panels and inverters are both more efficient under cooler conditions. 4) Ground mount systems can easily be setup and maintained for less shading. Shading obviously causes a decrease in energy production. Not only can ground mount panels be setup to deliberately avoid shading, but they can also be cleaned easier in the case that they get dirty or if they are covered in snow. 5) Advanced system capabilities are more often available, more efficient, and easier to install. For example, the tilt angle of some systems can be manually adjusted to increase energy output for that particular season, while other panels can ‘track’ the movement of the sun for optimal performance. 6) It’s also becoming increasingly common for panels to generate electricity from light hitting the back of the panel (bifacial panels). Ground mount systems often have more reflected light hitting the back (especially when snow is on the ground) which can increase energy output by 30% in the winter months! 1) Annual average amount of full sunlight hours. The amount of sunlight that your region receives on an annual basis is arguably the most important factor in determining its potential output capacity. The above map shows how much energy your system will be able to produce over the course of a year due to average sunlight levels alone (these numbers account for fog and clouds). To view the solar map for your province, or to learn more about these maps and how to read them, please visit the Solar Energy Maps Page. 2) Temperature. As stated in previous sections, both solar panels and inverters are more efficient in colder temperatures. This is one reason why ground mount systems may be more efficient than roof mounted ones and why string inverters and power optimizers may be more efficient than microinverters on roof mounted systems (because the inverter can be placed on a shaded wall, away from the hot roof). A decrease in ambient air temperature around the solar panels of just 1°C leads to an increase in efficiency of ~0.45%! 3) Unexpected shading. The issue of snow is covered extensively in our article about snow and power production (another page). But in summary, panels that aren’t cleared of snow will produce about 5% less energy over the course of a year than panels that are (based on data from the Northern Alberta Institute of Technology). This means that investing in a snow rake would be a good idea, but it’s not the end of the world if you don’t, even in heavy snow environments. The only other unexpected shading factor worth mentioning is dirtying due to natural causes (dust cover, bird droppings, trees seeds, etc.). Solar panels are made to last a long time but just like your deck, it’s a good idea to clean them from time to time. As a general rule, you should clean your panels about as often as you would pressure wash your sidewalk – once every one or two years. The rain will do the rest. Over the past 10 years, commercially available solar panels have increased in efficiency by approximately 6% every year. This means that standard sized panels (17.55 sqft) are able to produce about 10-20 more watts per year. Interestingly, this increase in efficiency is not due to improvements in the underlying solar cells (which only increase ~0.55% per year), but rather due to changes to the entire solar panel. For example, LG has recently improved their panel’s efficiency by reducing the thickness of the ‘bus bar’, changing the shape of the bus bar from rod shaped to cylinder shaped, and by configuring the panel so that reflected light hitting the back of the panel can also generate electricity. Other manufacturers increase panel efficiency by making changes to the reflective coatings so that more light comes in contact with the cells, by changing the shape of the panel to increase airflow (decrease operating temperatures), as well by various other methods. Right now the cheapest solar on the planet is being installed in Mexico for ~2¢/kWh. Historically, due to rapidly improving solar technologies, this price will become the world average in approximately 2 years. Interested In Energy Smart Technologies?